Time to see this team of Power Rangers unleash the fury. 10,000 years ago, an evil dragon named Dai-Shi attempted to wipe out the human race so that he, his beast warriors, and animals could rule the Earth. Brave warriors channeled their animal spirits and after a great battle, known as the Beast War, they were able to defeat Dai-Shi's forces and capture Dai-Shi inside a box. In present day (2008), Pai Zhua (Order of the Claw), which was formed by the warriors that defeated Dai-Shi, continues training people in their arts to become warriors to protect the Earth in the event that Dai-Shi escapes. Pai Zhua Master Mao selects three warriors take on that task, and just in time as Dai-Shi gets free, reawakens his army of fear, and begins attacking and scaring humans in order to gather enough fear to restore the great powers he lost and conquer the world. The three Pai Zhua warriors follow Dai-Shi to the city of Ocean Bluff and find a new master. Their new master grants the students a way to fight Dai-Shi and his forces. 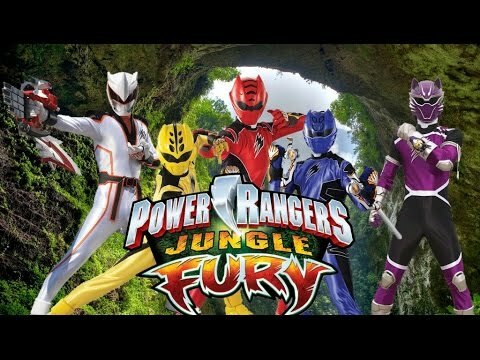 He gives them Solar Morphers which allow them to become the ferocious, animal-spirit-armed team of heroes known as Power Rangers Jungle Fury.